What Makes Shooting Glasses Effective? 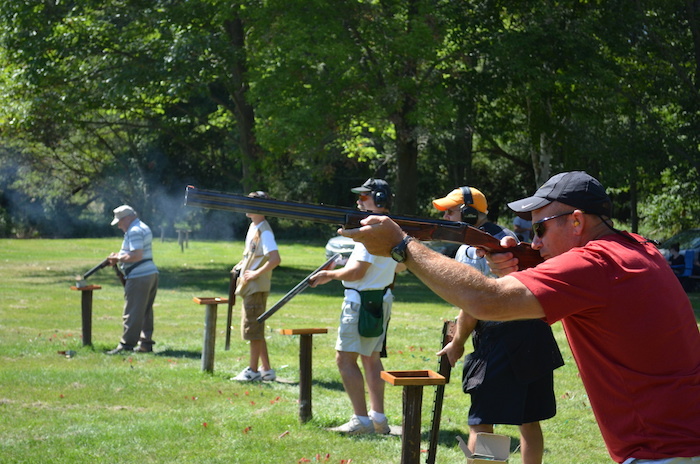 Protective eyewear options for gun enthusiasts and shooters of all levels exist in abundance. Taking into account what makes the best shooting glasses, however, acceptable options become considerably narrowed down to just a few good ones. You obviously know that you need to protect your eyes while out on your shooting excursions, but where do you start with all the shooting glasses available at a very wide range of prices? What features are important and how do you know whether a certain pair of shooting glasses or brand will be effective? Will the pair you settle on and potentially spend a healthy sum on actually do its job of protecting you if and when it matters most? Below is a carefully selected collection of shooting glasses reviews by Shooting & Safety that aim to point you in the right direction in recommending premium protective eyewear that will give you the peace of mind you need. Featuring tapered lenses as a standard inclusion in what is expected of top-range shooting glasses, the Smiths Optics Elite Aegis Arc Compact Eyeshield Field Kit does well to correct any distortion that may arise. As expected further (for this price range), US MIL PRF-31013 standards are met, which translates into a pair of shooting glasses that does its job of protecting the shooters’ eyes well. Protection against impact is the main order of the day and every bit of the shooter’s eyes is covered well. A lot of innovation clearly went into the creation of this shooting eye protection kit, better referred to as an eye protection system. Shooters with average to large faces get a good range of sizes, ensuring a nice, comfortable and tight fit for use at the shooting range or for professional law enforcement deployment. The clear lenses work well for indoor shooting and they’re interchangeable with the tinted lenses for adequate outdoor brightness protection. The design of the carry case is great too, offering good protection for all the kit’s contents while in transition. These are protective shooting glasses that particularly work well for hunting because of the different protective options contained in the kit. This is another case of premium dollar buying you premium quality in shooting glasses, with the ESS Eyewear Crossbow Suppressor 2X Deluxe Kit striking a balance between wide-ranging fit (and the associated comfort) and genuine eye protection. You’d naturally expect to get the full UV A and UV B protection offered, but this pair of shooting glasses excels most notably in the physical protection it offers. The impressive array of standards it’s complicit with include U.S MIL-PRF 31013, CE EN 166, ANSI z87.1+ (naturally) and even U.S Federal OSHA requirements. In practice, this means the shooting glasses will last longer and will give your eyes some of the best protection currently available. Design principles have gone beyond attractive physical appearance with these ESS Crossbows, however, because you can comfortably use them in conjunction with ear-cup type protective earmuffs. They were built for practical use in that way. Although offering a choice between three different lenses (Clear, High Definition Copper and Smoke Grey), the interchangeable smoke grey lenses aren’t polarized but are still effective at the off-setting glare. The suppressor frame is also of a shorter length than its standard frame counterpart, but this only adds to the variety offered by what is an overall great pair of shooting glasses. Adequate protection in shooting glasses doesn’t always have to come at a premium price. Case in point is the Wiley-X Saber Advanced pair of Shooting Glasses, which can be acquired for up to half of what other shooting glasses with the same set of features offer. You get the durability that comes with shatterproof optics, which in itself is great protection against the potential permanent damage that could otherwise arise from high-velocity object impact. No damaging fragments entering the eyes in case of breakage. Protection standards met include GL-PD 10-12 while MIL-PRF-31013 standards are superseded and physical eye protection and durability are reinforced by the nylon-based triploid frames. 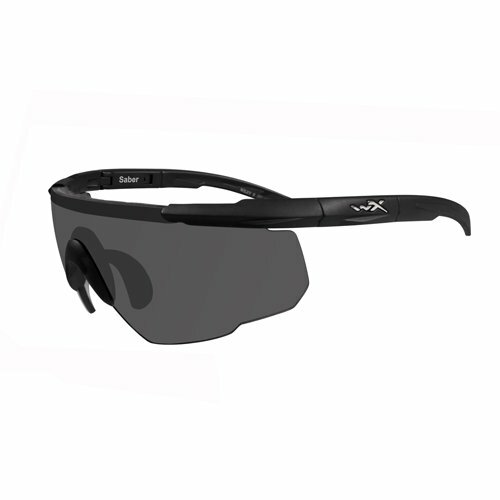 Vision protection is covered by the Wiley X guarantee of all their lenses blocking out 400 nanometers (100%) of the harmful Ultra-Violet rays of the sun. What’s good eye protection if it doesn’t fit, right? No fit and comfort issues with these Wileys, which also come with three different lenses, a strap as a possible replacement for the earpieces and a case. Definitely what you’d call a bargain because you get everything a top-of-the-range pair of shooting glasses offers at a very nice price. The important consideration is adequate eye protection and that’s exactly what you get in the affordable shooting glasses price range. 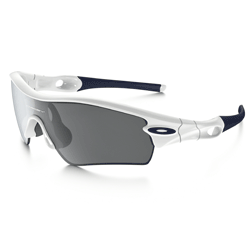 Oakley has long been known for their premium designs in eyewear, so much so that these Oakley Radar Path Sunglasses had the manufacturers quite reluctant to classify them exclusively as shooting glasses. These Radar Paths would do more than hold their own as pure protective shooting glasses, however, which is why the hefty price seems to baffle those consumers who don’t plan on using them as protective eyewear for shooting purposes. The fit is about as near-perfect as you get, comfortably embracing your eye-socket region while you move at speeds typically higher than those of someone engaged in shooting excursions would. From the point of view of a military man deployed in a real-life situation, these Oakleys are very durable and offer great clarity. If you need more than that from a pair of shooting glasses, the standard lenses make these protective glasses great for everyday use while offering 100% harmful UV and blue light protection. Great protection from high-velocity and high-mass object impact as a result of the O-Matter frame design. The feature list goes on and on, but for shooting purposes this pair of Oakley’s fit, performance and design make it great for prolonged shooting excursions, even though they’re not fully fogproof. Their fashionably good looks could have these Tactical Sunglasses by Smith Optics fit in with any contemporary outfit, but the keyword here is indeed ‘Tactical.’ Good looks are in no way a substitute for performance with these tactical sunglasses the manufacturers rightfully proclaim were specifically designed for law enforcement and military personnel. It doesn’t get all that much better than this as far as functional eye protection goes and you can rest assured your eyes are protected while you look good doing your job. For those who aren’t exactly employed in the military or law enforcement sectors, military-grade protection is just about as good as it gets if you’re looking to protect your eyes during your shooting exploits. Lens tapering ensures you get optics that are free of any distortion while also benefiting from full protection from harmful UV-A, UV-B, and UV-C rays. 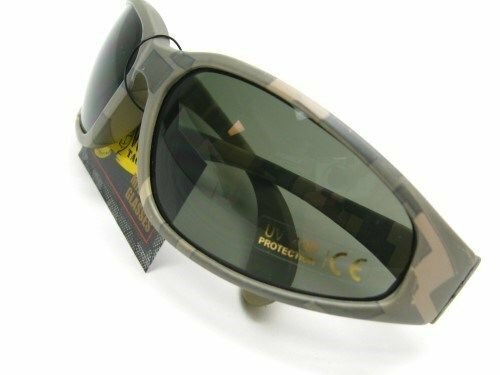 Perhaps most importantly though is the physical protection your eyes get as these tactical sunglasses satisfy the MIL-PRF-31010 US Military specification, which simply means they offer suitable impact resistance. Performance is aided by a good, comfortable fit as a result of the featherweight frame. If it’s good enough for military professionals, it’s probably good enough for you too. Any pair of ballistic sunglasses with the word ‘Military’ in their product name is worth taking a look at as possibly one of the best options in shooting glasses out there. These Revision Military Hellfly Ballistic Sunglasses have the attractive appearance of any ordinary sunglasses a fashionista with a classic taste in style would be proud to wear, but what we’re concerned with is how they measure up as eye protection for shooters. You definitely get what you pay for with this pair, which in this case is a solid of (shooting) sunglasses. If you need some serious eye protection, these are the glasses for you as they also meet the US MIL-PRF-31013 (Military Ballistic Impact) standards. They’d then naturally exceed ANSI Z87.1-2010 standards, but the protection goes beyond providing ample cover for unexpected fragment impact, which is catered to by the complete eye-area cover design. 100% UV protection (UVA, UVB, and UVC) is taken care of by the polarized lenses, while the polycarbonate used in the 0.09-inch lenses ensures a very clear vision. This Revision Hellfly also offers an almost completely clear field of view with minimal to no obstructions to the shooter’s peripheral vision either. 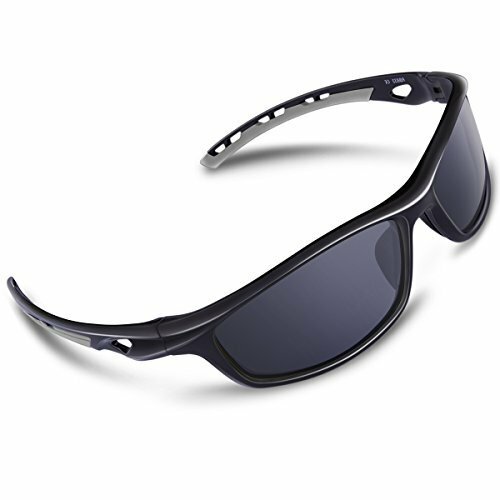 Very comfortable, functional, protective and durable shooting sunglasses. IMPACT PROTECTION : Frames are made out of polycarbonate and they’re impact and scratch-resistant. GLARE PROTECTION : 100% UV400 Titans. 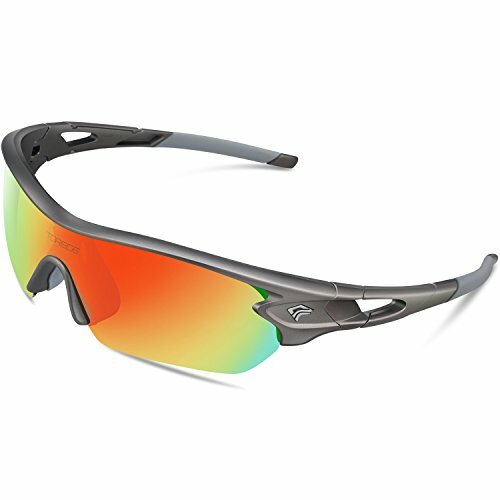 The Torege polarized sports glasses have a rimless jacket frame design that allows you to have a clear lower visual field. Both the glasses’ lenses and the frames are made out of polycarbonate and they’re impact and scratch-resistant. One of the things we enjoyed about these glasses is that they fit really well. The top of the frame rests close to your brow without rubbing it, and the bottom of the lens sits close enough to your face to protect against debris and insects but far enough to provide a good ventilation. The glasses are not extremely wide, but they will protect your peripheral vision against glares. The nose piece provides a soft yet firm grip that will keep the glasses stable while you move. The Venture Gear tactical glasses are designed to look like normal sunglasses, and they’re made out of scratch-resistant polycarbonate. These glasses come with high-quality metal hinges and anti-fog lenses that offer protection against the harmful effects of the sun and accidental impacts. We were impressed by the glasses’ design. This model comes with a soft nosepiece that will keep the glasses stable as you move, but it also relies on the non-slip rubber moldings on its sides to keep the glasses from slipping and to provide a reliable protection to your eyes. The glasses are lightweight and the lenses are not too dark. In fact, the lenses are dark enough to protect your eyes from the sunlight, yet light enough to offer a clear view of each object in front of you. The RIVBOS sports glasses come with a lightweight frame and polarized lenses. The multicoated lenses offer a good protection against sunlight, and they’re also durable enough to withstand the occasional hits and bumps. One of the best things about this glasses is that they have very clear lenses. The lenses’ coating restores true color and eliminates all of the reflected light to protect your eyes from the damaging effects of the sunlight. Another good thing about this model is that they are very comfortable. The glasses fit really well, and they won’t slip off your nose when you bend over or when you move. Moreover, these glasses come with a case, a cleaning cloth, and lanyard, which is impressive considering the glasses’ low price. 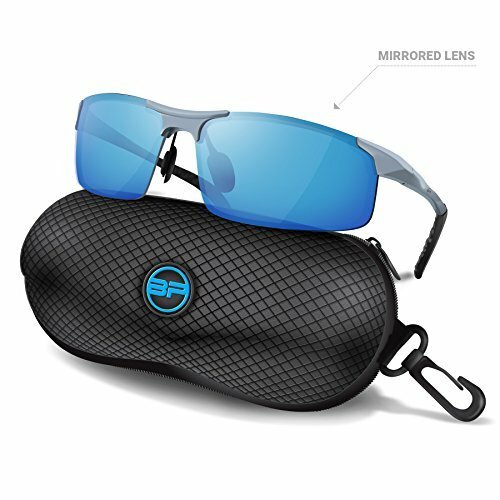 The BLUPOND sports glasses have a durable metal frame and come with high-quality polycarbonate lenses that are both shatterproof and treated to protect against the harmful effects of UV light. We were impressed by the glasses’ well-thought design. This model uses a semi-rimless frame that offers a large field of view without distorting the image, and the blue-tinted lenses neutralize the light and eliminate the glares, allowing you to take aim with precision in bright light shooting conditions. Another advantage of using these glasses is that they come with flexible frames that will fit most sizes. Not only will the frame fit properly on your face, but it’s also so lightweight you’ll hardly notice wearing them. The Wiley X shooting glasses have a wraparound design that will prevent them from moving even when you bend over or move quickly. These glasses come with both a rubber nosepiece and temple adjustments that will provide a comfortable and secure fit. One of the things we liked about this glasses was the high-quality image they provide. These glasses will stop all the UV rays from reaching your eyes, and the differently colored lenses will highlight the objects in your field of view in different environments. Even though the glasses’ lenses might seem thick at a first glance, this is actually an advantage. The increased thickness will allow the lenses to take a hit, improving the protection they offer. 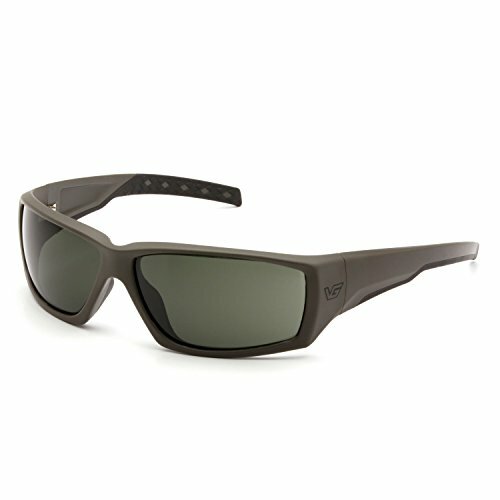 The VooDoo Tactical military sunglasses have a polycarbonate frame and shatterproof polycarbonate lenses. Both the frame and the lenses have a scratch-resistant coating that will prolong the glasses’ lifetime, and keep them looking as good as new. One of the good things about this model is that the lenses come with a UV400 filter that will protect your eyes against the harmful effects of the sun, as well as allow you to shoot accurately in bright light conditions. Even though these glasses are advertised as fog proof, they will at times get foggy when the lenses are cooler than your body temperature. However, the lenses will not be foggy for long, allowing you to take accurate shots within moments of putting them on. The glasses’ frame is lightweight yet durable, but their color doesn’t match the ones you see in the pictures. There is no doubt about it, protecting your eyes while you’re out on your shooting excursions is crucial to preserving one of the most precious gifts of life, the gift of sight. At the very least you’d wear shooting glasses to prevent the slightest of eye injuries or irritations, but the best shooting glasses could go as far as saving your life, let alone your precious eye functionality. In the most extreme of shooting accident cases, good eyeglasses can act as the last line of defense between something like a big metal chunk and its sharp edge penetrating your brains through your eye-sockets and very likely killing you. It’s a bit of a morbid picture to paint, but a very necessary one nonetheless because this highlights the sheer importance of eye protection. You need to protect your eyes at all times when handling firearms because accidents are often unexpected with dire, often irreversible consequences. It’s not enough to just buy a pair of shooting glasses and expect adequate protection in the event of an accident. Sure, you might feel that much more “protected” with a pair of cheap shooting glasses on, or any glasses for that matter, but all it takes is one accident to demonstrate to you just how ineffective your eye protection can be. That is not how you want to find out that your cheap pair of shooting glasses is ineffective, but what makes shooting glasses effective then? The types of shooting accidents your protective glasses might have to protect you from typically include hazards such as blunt, sharp or fragmented objects flying at your face at velocities too high for your reflexes and instincts to protect you and so your shooting glasses should ultimately be effective in protecting you from the associated harm, or at the very least minimizing the injury and damage potentially suffered. Ballistic protection is perhaps the most important aspect of what makes shooting glasses effective and it basically entails protection against the effects of the impact. As mentioned earlier, shooting accidents or normal shooting events may result in a high-velocity impact to the eye area, featuring hazardous objects such as fragmented flying pieces, solid pieces or a combination of both. So effective shooting glasses should be able to offer protection against such objects or at the very least limit, the injury you might have suffered had you not have been wearing protective shooting glasses. Good shooting glasses should go beyond ballistic protection and also offer your eyes and the surrounding eye area protection against the elements. Such environmental factors typically include harmful Ultraviolet (UV) rays of the sun and perhaps the strain your eyes might take when required to see through the lenses of protective shooting glasses. Even if you’re merely shooting at an indoor shooting range, your eyes would still need adequate protection from environmental factors such as dust particles, invisible and often overlooked and underestimated gun-powder residue, and perhaps even some liquid that could unexpectedly get sprayed in your eyes. Eye protection is only as good as when you actually have it on and so fit and comfort form a very important part of what makes shooting glasses effective. Comfortable-fitting shooting glasses are often a sign of shooting glasses which offer great cover and protection, so too ones that actually fit you properly and stay on in a situation where you might have to run, jump, crawl, roll or move at higher speeds than someone who is shooting statically. Depending on the caliber of the gun you’re handling, the protection that comes with your shooting glasses can be compromised by the recoil, so you have to make sure they fit you well and stay on. Shooting glasses that are too tight might cause discomfort, skin irritation or even induce skin reactions, which isn’t a very pleasant forced reality to have to submit to in the name of ballistic and elemental protection. A lot of manufacturers of shooting glasses enthusiastically highlight their product’s compliance with the ANSI Z87.1 standard, but that’s not really a requirement for shooting glasses which offer adequate ballistic protection. Military standards (MIL-PRF-31013) are what’s required for what is effectively a good pair of shooting glasses that will give you the ballistic (physical) protection you’ll need. Shooting glasses that comply with ANSI 287.1 standards simply means they’ve been tested to offer impact or non-impact protection against hazardous objects such as fine dust particles, mist, optic radiation, liquid droplets, and splashing. If the product is marked as being compliant with Z87+ ANSI standards, it has passed all the high-impact test requirements while “non-impact” ANSI tested products are marked only with the Z87 code (without the addition sign). So you can see why shooting glasses with only an ANSI rating may not be adequate to offer the required protection for your eyes. The minimum requirements of shooting glasses that meet U.S. military standards are such that the protective glasses must always be able to withstand a 5.8 grain, 0.15 caliber, projectile with a T37 shape, traveling at a velocity of between 639 and 661 feet per second. Additionally, for shooting glasses to satisfy the requirements of this standard they must offer adequate protection from the harmful UV rays of the sun and they must offer a good fit, be resistant to chemical wear and must maintain their protective properties in the event that they’re exposed to varying temperatures and humidity levels. So MIL-PRF-31013 standards are essentially what you’ll be looking for in a decent pair of shooting glasses that will give you the required amount of physical, elemental and comfort protection. For products aimed at the European market or indeed if the shooting glasses you’re thinking of buying were manufactured in Europe, EN166 Standards are a decent indicator of a good pair of shooting glasses that provide adequate cover and protection. EN166 standards test shooting glasses according to ballistic protection levels, including Increased Robustness, Low Energy Impact, Medium Energy Impact, and High Energy Impact. The highest protection levels under these EN166 standards are those against High Energy Impact and products which comply with these standards are marked with the letter “A.” This translates into the shooting glasses showing the ability to offer protection from a 0.86gram, 6mm steel ball hitting the glasses at a velocity of 190m/s, adequate protection by any stretch of the imagination. Physically testing the quality of any pair of shooting glasses you’re considering buying presents us with a conundrum because who is willing to be a guinea pig and risk injury or potential permanent damage, testing the glasses on themselves? Even if you were to put the shooting glasses on a mannequin or make-shift human head prop, putting them through their paces and pushing them to their limits might actually damage your expensive pair of shooting glasses to the point where you can’t use them further. The only attribute you can physically test before buying is the fit and comfort. Make sure the shooting glasses give you adequate cover and subsequent protection; there must be no opening which would allow any fragments or bigger-sized objects to reach your eyes unobstructed. Also, make sure that the shooting glasses are comfortable and don’t irritate the surface of your skin. If your shooting glasses fit you and are comfortable, you’ll never be discouraged to wear them at all times when you need protection. If you’re also planning on wearing ear protection, make sure the shooting glasses are designed in such a way that the simultaneous use of earmuffs doesn’t cause discomfort. 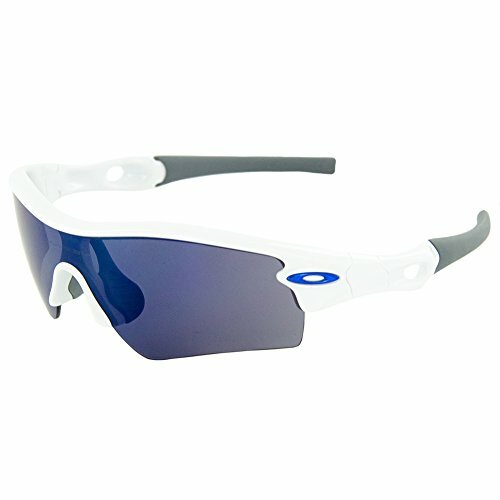 For the most important form of protection, however, which is ballistic (physical protection), you’d have to rely on practical user reviews and you also have to know how to interpret the information given by the manufacturers about the shooting glasses’ features and the standards they comply with. As mentioned before, the Army Authorized Protective Eyewear List (APEL) is a great place to start if you want to make sure you get ballistic protection deemed to be good enough for the U.S. military, but some protective eyewear products haven’t yet made the list and yet but still offer adequate protection. Be sure to check for either a MIL-PRF-31013 certification standard or an EN166 B or (preferably) “A” certification standard and you’re generally covered as far as adequate ballistic protection goes. That said, most (if not all) shooting glasses that meet these standards and subsequently offer good protection have a one-piece lens as opposed to two (co-detached) lenses. The impact protection extends to better impact force distribution (shock-absorption), as injury could otherwise also be caused by the force of impact to the areas surrounding the eyes (where the glasses make contact with your face). Try to avoid those shooting glasses (even one-piece glasses) that have a small or thin bridge (the area connecting the two lenses). As far as elemental protection goes, this is another feature which you can’t really test physically before buying. Again, you’d have to rely on user reviews, but if you know how to interpret the manufacturer’s feature list you can ensure you get the required protection from environmental factors. UV protection is important if you’re going to be shooting outdoors, in the sun. Protection against fogging isn’t all that important because you can simply wipe down the shooting glasses when the need arises, but the glasses must be resistant to possible moisture damage or chemical damage, within reason. Remember that shooting glasses, like anything else in life, don’t last forever. People usually consider investing more money in hunting binoculars. Their usefulness in offering protection declines with time, even in the case of the most expensive shooting glasses used by the military. Prolonged exposure to heat (such as direct sunlight) inevitably wears them down and so you should replace your shooting glasses as often as possible. Some manufacturers indicate their shooting glasses’ lifespan to be in the region of 6-12 months, but depending on how often you use yours and under what conditions, you can stretch this (in some cases) up to 18-24 months, but never longer than that. An older pair of shooting glasses would make a great way to test the strength of that product, but be sure to keep in mind that the effectiveness inevitably decreases with time and continuous use. Unlike with many other firearm accessories and even firearms themselves, choosing the best shooting glasses is not a matter of personal preference, unless its design and style is your only consideration. 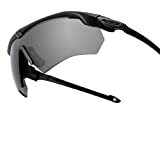 You want protective eyewear that will do a good job of protecting your eyes from the very real dangers associated with shooting and hopefully, these featured shooting glasses reviews will have served to highlight exactly what you need to consider when choosing your protective eye gear. Remember that you might have to spend a little time to effectively ensure your safety, but ultimately there is no price for protecting your vision. What are the best choices for shooting glasses that fit over regular prescription lenses? Or, is it possible to get prescription shooting glasses? You need an insert, e.g. ESS Vice Rx for ESS Crossbow/Suppressor glasses – a little device that holds prescription lenses behind the shooting glasses.